THE green-fingered grafters at a brand new residential home that will serve the Woking community have been busy bees making their outside space look beautiful. Even though Lakeview Care Home in Lightwater has not yet opened, staff and residents were keen to make their mark with their first entry into the Hallmark in Bloom competition. And their efforts paid off when they were announced the winners of the New Homes Garden Award in the company-wide gardening contest across all Hallmark Care Homes. 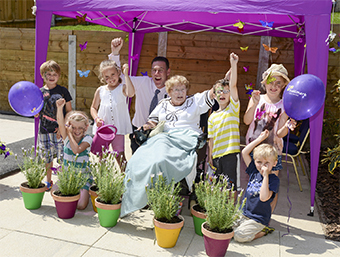 Residents were itching to get involved and the first, Enid Peake, who will move in when the home opens in November, helped paint lavender pots and get the home’s outdoor space ready for the judging. Grandchildren of another resident came along for the day to help set up the butterfly display and learn about the creature’s life cycle. Lakeview is currently looking after chrysalides, which have transformed from the caterpillars, leaving the home eagerly awaiting the arrival of five beautiful butterflies. Customer Relationship Manager Sally Garland said: “We were so happy to win. We all put in a lot of effort, so it is wonderful, especially since Enid and the children have been taking part.